Applying for a visa as a migrant (i.e. for permanent residence) is confusing, difficult, expensive and time consuming, and this has spawned a wealth of migration consultants and keeps thousands of civil servants in ‘employment’. The Australian government is constantly changing the rules and sometimes introduces retrospective changes that apply to applications already lodged (but not processed). 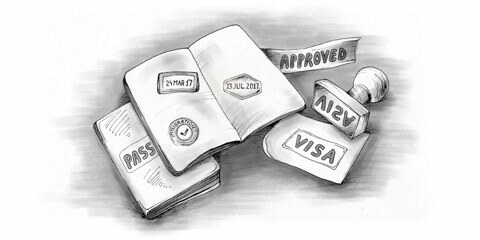 Before making an application, check the latest regulations and criteria for visa applications. Even when new requirements have been announced, they may not be introduced for many months or even years, and could even be rejected by the upper house (Senate) of the Australian parliament after being passed by the lower house. Family migration, where people can be sponsored by a relative who's an Australian citizen or a permanent resident. Skilled migration, with categories for people with particular business or work skills or ‘outstanding talents’ and a separate quota for states or territories with particular skill shortages. Special eligibility migration, covering former citizens or residents wanting to return to Australia, and also certain New Zealanders. The Department of Immigration and Multicultural and Indigenous Affairs (DIMIA) offers an enquiry service (local call rate 13-1881 or www.immi.gov.au ) for further information. The form Migrating to Australia – Who can migrate? (957i) contains general information about migration and the various categories. An Application for Migration to Australia form (47) must be completed by all applicants wishing to travel to Australia to live permanently. There’s a fee (e.g. around £5 in the UK) for this form and the information package. If you wish to inquire about an application it must be made in writing, quoting your DIMIA file number, although you may telephone the DIMIA and enquire about the progress of your application (but this can delay its processing). Application fees for migrant visas are high and aren’t refundable, so you should ensure that you have a very good chance of being accepted before making an application (otherwise you would be better off spending your money on lottery tickets!). Applicants for migration visas must pass health and character checks before they’re granted a visa. All application forms must be completed in English and you must provide originals or certified copies of all documents (as requested). You must usually provide certified copies of documents such as birth and marriage certificates, educational and trade qualifications, and employer references. Assessments of some trade and professional qualifications can usually be done fairly quickly, although if they must be referred to Australian professional bodies it can take up to six months. All documents must be certified by a legal professional, a Justice of the Peace or other person authorised to witness statutory declarations (e.g. a Commissioner for Declarations in Australia), who must state that the photocopy is a true copy of the original. Original documents mustn’t be sent unless specifically requested. Additional information concerning your application can be provided at any time (and is taken into account) before a decision is made. You must keep the DIMIA informed of any changes in your circumstances if they relate to information already provided that’s no longer correct. If you provide incorrect information or documents, your application or visa can be cancelled. If you meet the criteria for migration to Australia, you and your family members are invited to attend an interview with an officer of the DIMIA. If you fail to attend a scheduled interview your application won’t automatically be refused and a decision may be made on the basis of the information already provided. If you’re invited to an interview, take care how you answer seemingly innocuous questions such as ‘Why do you wish to emigrate to Australia?’ It’s recommended always to answer positively and rehearse your answers to potential tricky questions. If you’re accepted for immigration, you’re asked to send your passport to the embassy or consulate and a visa is stamped in it. You must usually arrive in Australia within six months of the date stamped in your passport. If you don’t enter Australia by the ‘initial entry’ date of your visa, it expires and you need to re-apply for migration. If you enter Australia by the initial entry date, you will have used (or validated) your migrant visa and by doing so will have become a permanent resident (if applicable). Permanent foreign residents of Australia don’t receive the same rights as Australian citizens with regard to their freedom to leave and enter Australia. If you migrated to Australia before 1987, you will have been issued with either an Authority to Return (ATR) or a Return Endorsement (RE), which are valid provided you haven't been out of Australia for more than three years and you haven't become a citizen. However, if you migrated to Australia in 1987 or later, your initial visa gives you permission to return to Australia for three, four or five years after first entry. After this time, if you choose not to apply for Australian citizenship, you must obtain a ‘ resident return visa’ (RRV) before leaving the country, which allows a permanent resident to return to Australia within a period of either three months or five years. Whether the visa is granted depends on how long you've spent in Australia during the previous five years. An RRV cannot be extended and you shouldn't wait until the visa expires before applying for a new one. You should check well in advance if you're eligible for a new visa. If it expires, you must apply for a new one and the amount of time you've spent outside Australia in the five years immediately before your application determines whether you’re eligible for a new visa and, if so, what type. For example, if you've lived in Australia for at least two years within the last five, you're probably eligible for an RRV which gives you the right to remain outside Australia for up to five years. If you aren’t eligible for a five-year RRV you may be eligible for a three-month RRV. If you choose to return to Australia just before your visa expires, you're obliged to remain there for at least 12 months before you’re eligible for another RRV. If you need to leave because of an emergency during this period, you're allowed to do so only once. There’s a strict quota on family migration (or 'preferential family'), which in 2004/05 was 42,000. Of these places, 27,900 were reserved for spouses of Australians, 5,300 for fiancé(e)s, 2,800 for children including adopted children, 4,500 for parents and 1,500 for other dependants and special need relatives. Applicants in the family category need to be sponsored by a relative, who must be aged at least 18 and a settled Australian resident (which is generally accepted to be the case after two years’ continual employment). However, in spouse and parent classes, a minor child can act as a sponsor under certain circumstances. Your relative in Australia must undertake to assist you financially and with accommodation during your first two years in Australia, plus, if necessary, attendance at English-language classes. The points test doesn’t apply to family applicants. Introduction: Who needs a visa to come to Australia? Working Holiday visa: Who’s eligible?